From left to right, Stephen Cook, University of Rochester; Patricia Britt, benefits specialist, RIT; Susan Figaro Grace, health nutrition coordinator, RIT; and Kristine DiBitetto, health project coordinator, UR. Cook and DiBitetto presented Britt and Figaro Grace with an award recognizing RIT as a breastfeeding-friendly worksite. 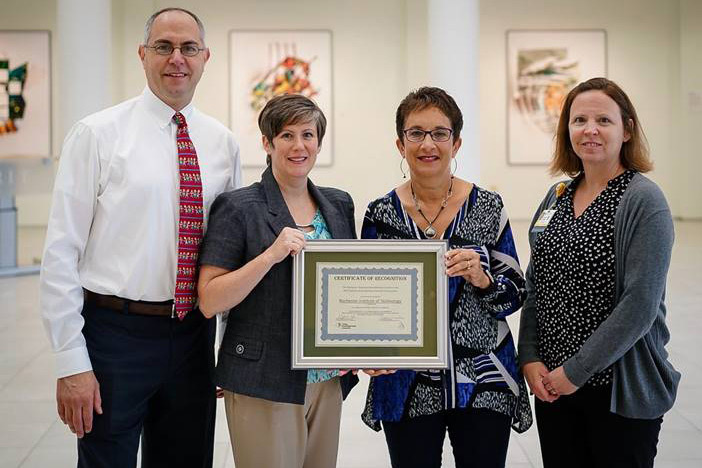 Rochester Institute of Technology was recognized for participating in an initiative by the University of Rochester to support breastfeeding women in the community and the workplace. UR has been awarded a grant for “Creating Breastfeeding Friendly Communities” from the New York State Department of Health. This funding will create or expand community-based breastfeeding coalitions and help increase the number of health-care practices, child care centers and day care homes that achieve the NYS Breastfeeding Friendly Practice designation; the number of worksites that provide accommodations for breastfeeding employees; and the number of Baby Cafés where breastfeeding women receive expert and social support. RIT is participating in the worksite component of this grant. RIT’s policies to support breastfeeding employees includes informing employees about breastfeeding and lactation management services, providing designated private space for breastfeeding or expressing milk and allowing flexible scheduling to support milk expression during work. According to the U.S. Centers for Disease Control and Prevention, mothers are the fastest growing segment of the U.S. labor force. Approximately 70 percent of employed mothers with children who are 3 years old or younger work full time. Working outside the home is related to lower rates of breastfeeding initiation and a shorter duration of breastfeeding. RIT also was recognized for its breastfeeding support during World Breastfeeding Week this summer.